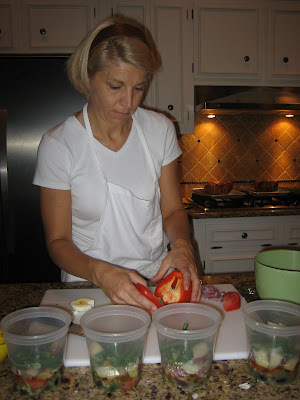 Saturday morning I was in for a treat when I attended a very intimate, fun cooking class with some friends at the instructor's home. 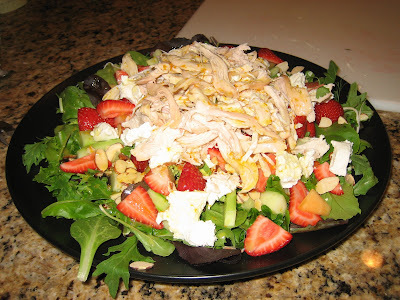 We prepared several delicious salads, my favorite being the Blue Cheese Cherry Chicken salad that I must make again at home! The photos say it all! I really loved this class because we really got to eat! 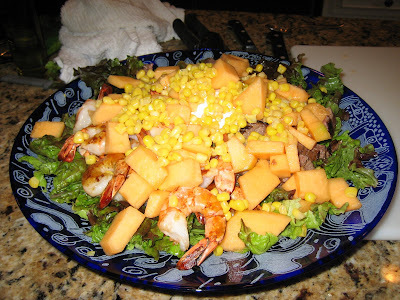 None of this - here's one bite thing. 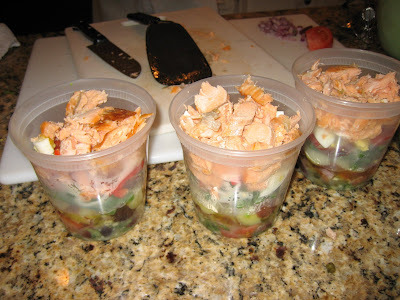 Here are our salads, ready to go! 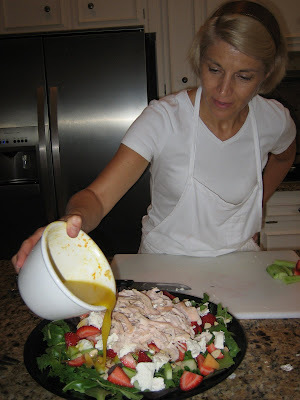 Orange Chicken Salad - the dressing goes on! 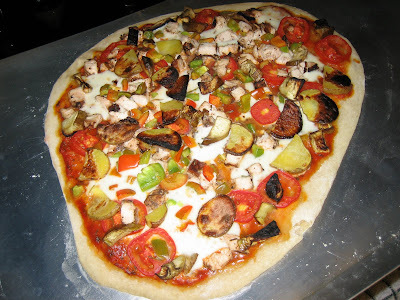 On Friday night Cal and I made our own pizza from Trader Joe's dough, balsamic chicken, fresh mozzarella, roasted potatoes, green peppers and tomatoes. It was quite tasty, although I'm interested in buying a pizza stone to make it more authentic. We were inspired by the awesome pizza at Cameli's, especially the Joey Woolum pizza, which is our favorite (with jalepenos, add chicken!) I will try and do a post on that soon. 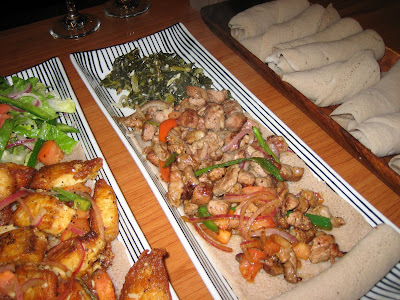 Desta has become one of my favorite Ethiopian restaurants in Atlanta. 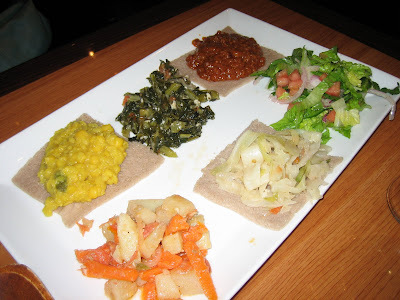 Situated at the corner of Clairmont and Briarcliff, it shares the corner with several other restaurants serving Ethiopian food. 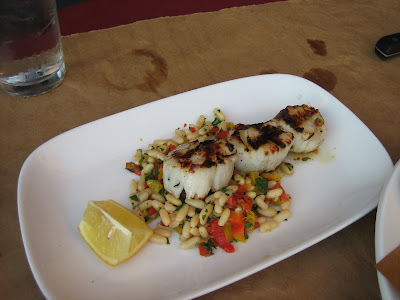 I found the taste here as well as the service and atmosphere, very pleasing. The wait was also shorter than average for Ethiopian food, which many know can take longer than you ever thought possible (I'm reminded of a now-closed place in Hampton, Virginia where a friend and I waited over an HOUR for lunch to arrive at an Ethiopian restaurant in 2005 - we were the only patrons!). 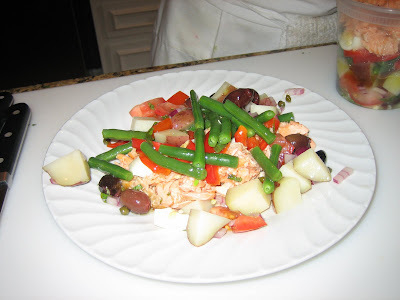 But the main attraction here is the food: the fish (we learned later it's tilapia) with salad is simply amazing. I have been craving it ever since I tried it the first time. 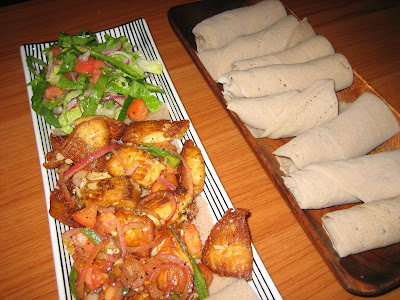 The flavors are pungent yet not overwhelming and the lightness of the fish allows more room to use the spongy injera to soak up the juices from the meat and from the delicious salad. The lamb dish we tried was good, but not as unique or exceptional as the fish. The vegetarian platter was steller, with quite a variety including my favorites - the collards and carrots & potatoes. When I go back, I'll be lobbying whoever goes with me to share the fish and the veggie platter. Matty Cakes is a relatively new bakery, conveniently located on Piedmont next to the "Gorilla Car Wash." I have enjoyed their cupacakes several times - the chocolate with cream in the center and the red velvet are my favorites and their giant cookies are fantastic. Today I stopped by with a couple of friends to try the goodies pictured above. 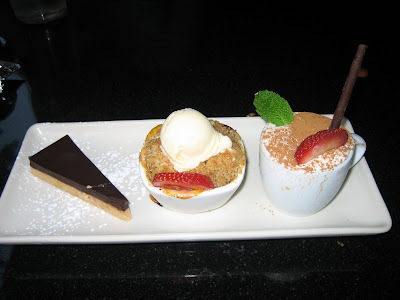 The two chocolate desserts were fabulous, moist and rich with lots of chocolate. I love crumb crusts and the chocolate cookie crust on the mousse cake is one of my favorites. The banana nut cupcake was not as good - the cake was dry, leaving the icing to try and compensate, which is did to an extent, but really, there is no reason a banana cake should be dry - ask anyone who has tried my famous chocolate chip banana bread! Matty Cakes also has great sandwiches, which we pick up on occasion from my office. 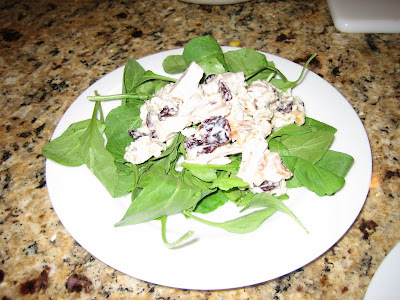 I adore the turkey, cranberry brie sandwich on their homemade multigrain bread - TO DIE FOR! I've also seen some of their specialty cakes, including a cake shaped like a handbag. If you like that kind of thing, I'll bet they can make any shape cake you'd like. The owner is also around and friendly to those coming in to pick up orders. There is no seating in the place so be prepared to take out - it's near Piedmont Park so you could get great fixins for a picnic and go sit outside! Einstein's - not so much a genius but good Dessert is Near! I won a gift card to Metrotainment restaurants back in January, so I thought it was high time to put it to use. Cal and I planned to attend the Friday Jazz at the High Museum, so we parked between the museum and Einstein's and walked to dinner, jazz and then dessert. Unfortunately we soon figure out that weshould have tried Cowtippers - or somewhere other than Einsteins to get our use out of the gift card. We sat on the patio and the flies were horrible. We should have moved inside immediately but instead suffered through the meal. The inside of the restaurant is actually quite appealing, with modern decor and a pleasant ambiance. 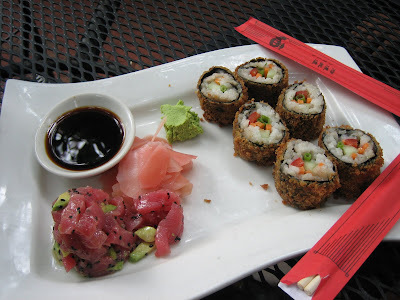 The "sushi" appetizer, which I think has now gone off menu, was the best thing we tried, although it was far from exceptional. The cucumber salad tasted like cucumbers and Siracha - nothing else. While I love Siracha, this is not what I expect when ordering a cucumber salad. 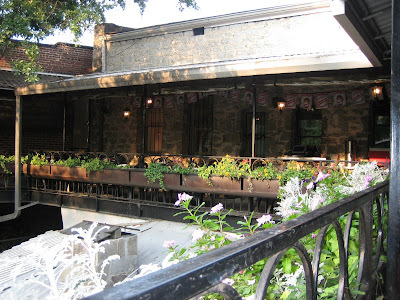 I would not recommend this place where there are so many other midtown hot spots with much better food. 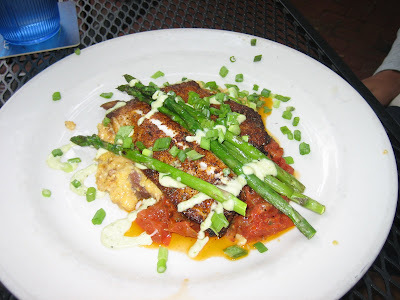 Fish with Asparagus - can't remember what kind! 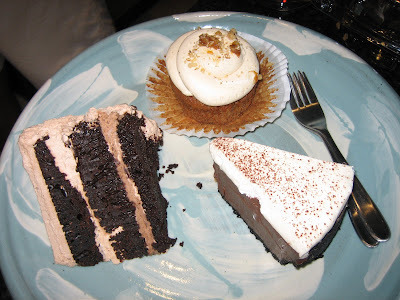 Upon returning from the jazz event at the High, we stopped at Chocolate Pink for dessert. 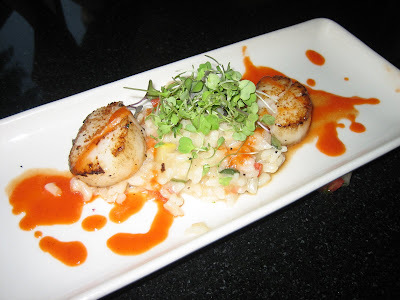 They have meticulously created lots of great choices, although the prices are quite high. 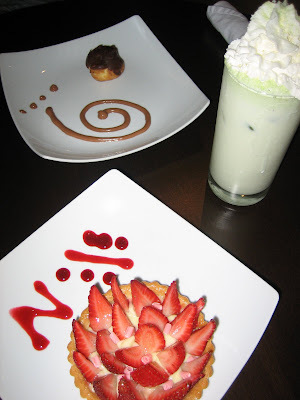 The atmosphere is calming yet trendy and we enjoyed the strawberry tart and chocolate concoction, although the melon green tea drink was cloyingly sweet. 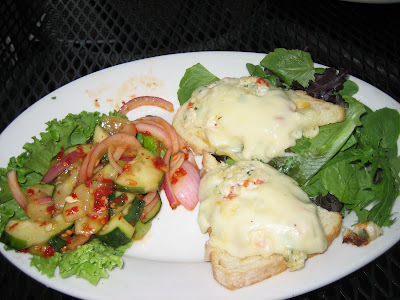 We dined at Fritti recently on the sidewalk patio. 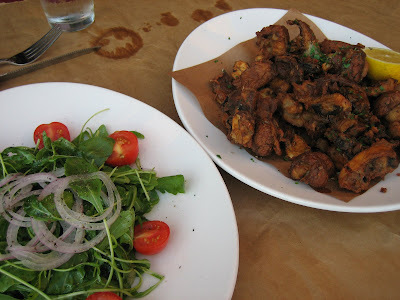 Everything we tried was tasty, especially the fried melange of mushrooms. 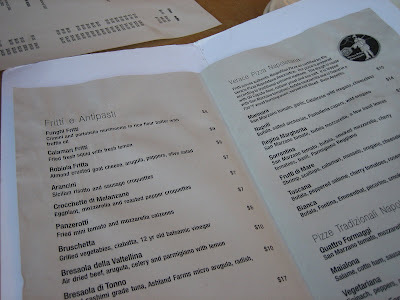 I want to go back soon to try the calamari pizza, which one of my friends says is very worthy. You can also buy fresh pizza dough to create your own pies at home - interestingly some of the chains will not sell the dough for fear of you duplicating their "secret recipe". I'll take Fritti's over a chain any day! 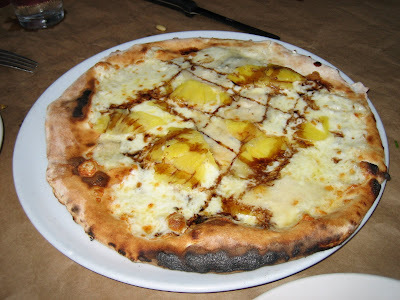 Pizza with pineapple and lots of cheese! Delish. 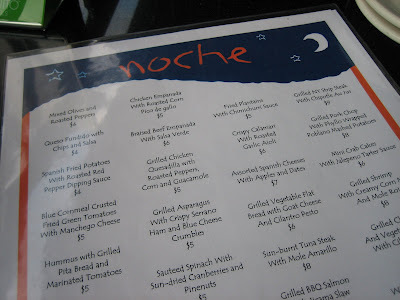 I dined at Noche recently with a friend to celebrate her birthday. We sat on the lovely patio and even though it was quite hot I was glad to be outside where it was much quieter than in the dining room. 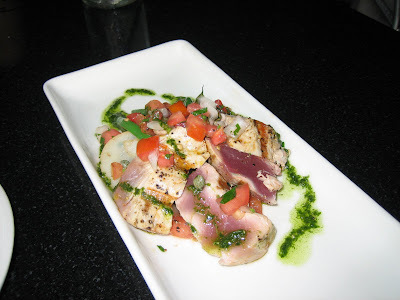 Overall I was not blown away by this place - I think Pura Vida and even Eclipse di Luna have much better food, but the location is trendy and I enjoyed trying it out. 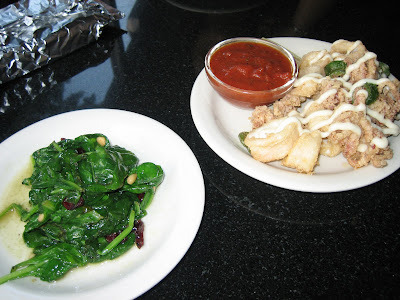 The calamari was tasty and I liked the addition of dried cranberries to the spinach.